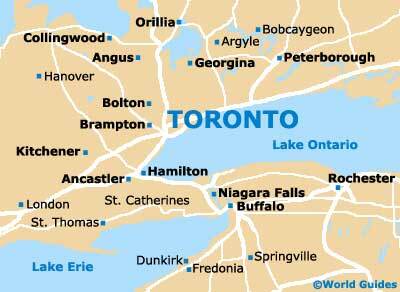 Canada's biggest city, Toronto is the capital of Ontario (ON) and is a lively and exciting metropolis. Toronto is a major economic center and home to many impressive skyscrapers and spectacular buildings, with are centered around Toronto's organized downtown gridwork. Home to the University of Toronto and a number of compact districts, Toronto is a city of arts and culture, also featuring some vast shopping malls, numerous top nightspots and many lively restaurants, which frequently offer seasonal outdoor seating areas. Toronto has become noticeably more relaxed during the past few years and this is reflected in day-to-day city life. 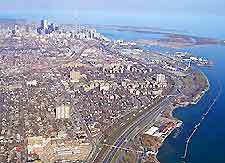 The outcome of an amalgamation of five nearby cities in 1998, the resultant city of Toronto is often aptly referred to as simply the 'Megacity'. With so much accommodation on offer in Toronto, where to stay depends very much on your specific travel requirements and budget. Hotels in Toronto are particularly clustered in the downtown district around Brampton, Markham, Mississauga, and Pickering, close to the city's many attractions, such as restaurants, shopping areas and nightlife. Other popular accommodation options in Toronto include bed and breakfast lodging around Toronto's Cabbagetown, Chinatown and Greektown districts. Further desirable hotels can be found on the Lake Ontario waterfront, and close to the nearby Toronto Pearson International Airport (YYZ). 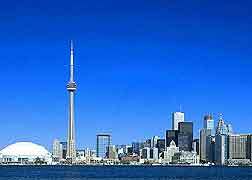 More information about Toronto Hotels. Tourism in Toronto is thriving, with many local hotels and businesses geared up for the Toronto's busy tourism trade. The main tourist information bureau in Toronto city is the Tourism Toronto center between Yonge Street and York Street. Offering a good selection of tourist information, leaflets and maps, a further office of Tourism Toronto is located in the Metro Convention Center along Front Street West. Also, the conveniently placed Ontario Travel Center stands in Toronto's Eaton Shopping Center. Toronto's many tourist attractions include the CN Tower - famous for being the tallest free-standing structure in the whole world, with an observation deck and revolving restaurant offering superb panoramic views across Toronto and beyond; Casa Loma - a truly unique castle in the very center of Toronto, with almost 100 rooms, grand gardens with fountains, and regular guided tours; Toronto's New City Hall - a contemporary and stylish building dating back to 1965, featuring two towers, a Henry Moore statue and a public area which becomes an outdoor ice skating rink each winter; and Ontario Place - a major summer theme park attraction for all the family, standing alongside Lake Ontario, with fast rides and seasonal entertainment. More information about Toronto Tourist Attractions. Royal Ontario Museum - highly rated throughout Toronto and Ontario, known for its extensive collections of Native American artifacts and important exhibits from Egypt. More information about Toronto Museums and Art Galleries. Tourist attractions located nearby Toronto include the Woodbine Racetrack - a major horse-racing track situated in nearby Etobicoke, close to Toronto's downtown district and featuring free admission; Toronto Zoo - highly regarded and rated as one of the best zoos on the planet, with over 5,000 animals and landscaped gardens; the Toronto Islands - comprising three separate islands, Center Island, Ward's Island and Hanlon's Point, accessed by a short ferry trip, with recreational activities, beaches and the Centerville Amusement Park; and the Scarborough Historical Museum - a popular family attraction standing in Scarborough's Thomson Memorial Park, just a short trip from Toronto. More information about Toronto Attractions Nearby.